When BCal took delivery of their new DC10's a set of keys is handed over at the delivery ceremony. These traditionally were keys to the cockpit door when cockpit doors had key locks. I am pleased to say that the late Maurice Hale had the ceremonial fobs from seven of the eight aircraft delivered. His son Steve has kindly sent in photos and they are below. The list is in delivery order (BM arrived before BL).............but does anyone have a fob for Bravo Mike please? It would be great to add in an image of that missing fib to complete the photo - see below. And what of G-MULL and G-NIUK....or the BCal Charter DC10-10s (G-BJZD, G-BJZE and G-GCAL)? Dave spotted that the key fob for G-BHDI had been incorrectly engraved G-BDHI.........well spotted, I had missed that......as had many when they were checking them for issue I am sure. But least the reg on the aircraft was correct! After a few short months, I am pleased to say I think I have found the missing key fob. It was listed on eBay of all places and was being offered by an animal charity as part of their fund raising efforts. My bid was successful, and I am pleased to show it here happily for all to see. It is the same size, the same design on the rear, it has lost its chain, and instead of the registration it commemorates the "First Delivery DC-10 Series 30". This may support the possible thinking about the out of registration sequence delivery. BEBM arrived before BEBL, so a non-registration specific key fob would fit any "last minute" schedule changes. 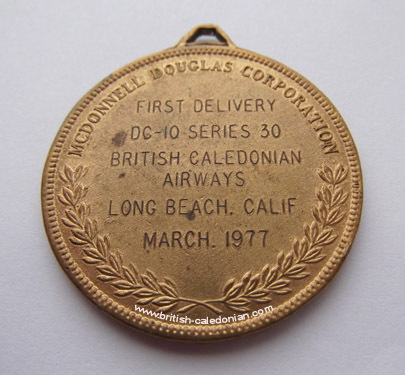 But maybe a BEBM specific key fob is still out there, but I think this is probably what was issued by McDonnell Douglas for BM.